This pan looks pretty incredible to be honest and I know that lots of men would agree. Multitasking/laziness at its peak. I love this practical yet stylish gift, perfect for those who like their gadgets. I bought one of these for Ed and it’s actually pretty good! I ended up giving it to him as an early present and he loved it. A great novelty gift for the Lego lover in your life. This vegan friendly brand have put together the ultimate ‘survival kit’ for your man. Men who can only dream of owning a super car can at least experience driving one if only for a day with this brilliant gift experience. Popular Jack Reacher series continues with the latest addition available in hardback from Waterstones. This novelty gift would be the perfect gift for those blogger boyfriends out there! If you have never played this game you are missing out! If they already have the original set, there’s plenty of expansion packs available online to keep the offensive fun going. Although this is my worst nightmare, being claustrophobic, the concept behind this experience Gift is pretty cool. Plus as it’s for two people you can go along too, win win! This gift is amazing value and smells so nice. Plus the advert has Gerard Butler in it, what’s not to love? For the man who always asks to put stuff in your handbag, this bag is perfect for anyone who travels, as a work bag or even as a stylish manly alternative to a nappy bag for new fathers. Want your man to get in the festive spirit but he refuses to tack it up? This jumper may just be the compromise. It’s stylish and festive. Yay! I love that this record clock can be personalised with their favourite record. Ed would definitely have Queen! What better gift than one that keeps on giving? Plus you get to eat the delicious curries each month too, woo! Buying presents for men are really difficult, I totally agree!! I am still struggling to find a few pieces so thank you for the amazing guide, love the ideas you have selected. There is a bit of everything there! I do love the master pan I must say! I love the little mini lego figures. I have already bought my bf’s pressie but this will come in perfect for a wee birthday pressie! The Master Pan is genius and I really like the Manscape Valet Drawer as well. The personalized mini lego figures are adorable, I can see many men loving getting one of those! My husband and I have been together for 16 years, so we have pretty much bought each other everything. But he loves cards against humanity. You have some great ideas here I especially love the charging station that is a great idea and well priced. 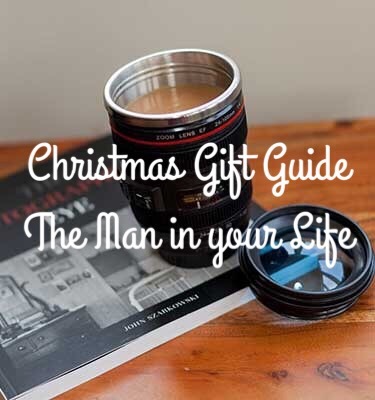 This is such a great gift guide. Men are so hard to buy for. My husband would love that pan! He has just discovered his inner chef! Currently struggling with what to buy for my boyfriend! I’m going to check out the vinyl clock, what a unique idea! Lovely gift ideas here. I really like the clock. Some really cool suggestions here – hubs loves Hugo Boss too!